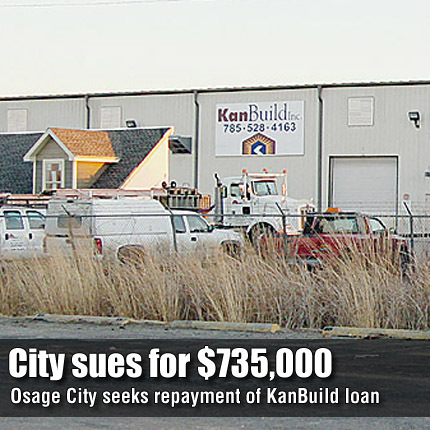 Osage City has filed a lawsuit seeking a judgment of $735,000 from a former president of Kan Build Inc., John W. Samples, of Burlingame. In a petition filed Dec. 14 in Osage District Court, Osage City’s attorney, Frederick Godderz, states that Samples signed and executed an agreement that obligated him to guarantee payment of a promissory note between Kan Build and the city. Court documents indicate the funds represented a loan to Kan Build, received by the city as a community development block grant from the Kansas Department of Commerce and Housing. “The Defendant was President of Kan Build Inc. at the time of the signing of the guaranty agreement and requested the loan from Plaintiff to Kan Build Inc. and as an inducement and condition of Plaintiff making the loan that Defendant agreed to and did execute the personal guarantee,” the petition states. The petition says the promissory note, executed May 24, 2006, was in default and payments had not been made according to the terms of the note.